Throughout the final year of centenary commemorations for the First World War, the V&A is displaying its ceramic poppies by Paul Cummins MBE. 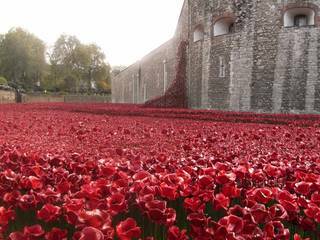 The sixteen ceramic poppies came from the poignant, dramatic and hugely successful installation 'Blood Swept Lands and Seas of Red', held at the Tower of London in 2014. The Museum's poppies, each subtly different from the next, honour the sacrifice of the sixteen members of V&A staff who lost their lives in the War.